From day one, this year started with a daily drawing practice. 31 days of January 2018 I produced one drawing each day. Drawings were made by a rolling ink stamp creating staff lines in a circle. This circular drawing was inspired by the zen related practice of the ensō; a meditative process, but also being a documentation of the creator’s state of mind and the context of creation in a brief period of time. I was amused by how easily patience and temper seemed to be reflected in the ensō. Using staff lines one couldn’t avoid the thought of circular music composition, rondos, or the idea of the sustained or repeated tone in minimalistic drone-based music, often characterised by lengthy audio performances. The Ensō/Rondo drawings were gathered, printed and published a few months later. Beautifully made by Joakim Norling and Timglaset (Malmö), this publication was launched at Malmö Artists’ Book Bienniale (MABB) 20th April, and later at the Small Publishers' Fair in London (November, 2018). The project is still for sale at Timglaset’s webside, here, but also at Malmö Konsthall (Malmö, Sweden), Butikken (Copenhagen, Denmark) and Bookartbookshop (London, UK). The biggest project, by far, this year was writing a chapter for the publication Geopoetics in Practice, to be published by “world's leading academic publisher in the Humanities and Social Sciences”, Routledge, due date around August 2019. The publication was initiated by Eric Magrane, Linda Russo, Sarah de Leeuw and Craig Santos Perez. My chapter, eventually entitled All Visuals Have Sound: The Verbalization of Geography and the Sound of Landscape, is looking at how my work can be seen in the connection with science, and geography in particular. Grounding itself in the question, What would an encoding of nature and geography sound like?, my chapter presents four art projects that share a geopoetic mindset. As I have not written an article this size before, it was a massive challenge, but nevertheless an intriguing challenge that I had great pleasure of doing. By help along the way by Åse Bredeli Røyset and Therese Saur, and the brilliant editor Dr. Julie Sutherland, this certainly has turned out to be of an experience of significance in my art practice. Working on this since September 2017, I’m excited seeing it in print this year. Who wants to do a paragraph puzzle? My biggest accomplishment this year was born July 25. She’s a real art piece. "p343 for Theodor W. Adorno" is composed with help from Theodor W. Adorno’s essay punctuation marks, where he claims punctuation marks to be “marks of oral delivery.” Because of that, they’re a sort of musical notation: “The comma and the period correspond to the half-cadence and the authentic cadence.” Exclamation points are “like silent cymbal clashes, question marks like musical upbeats.” Colons are like “dominant seventh chords.” This piece is a collaboration with brilliant singer Stine Janvin Joh. 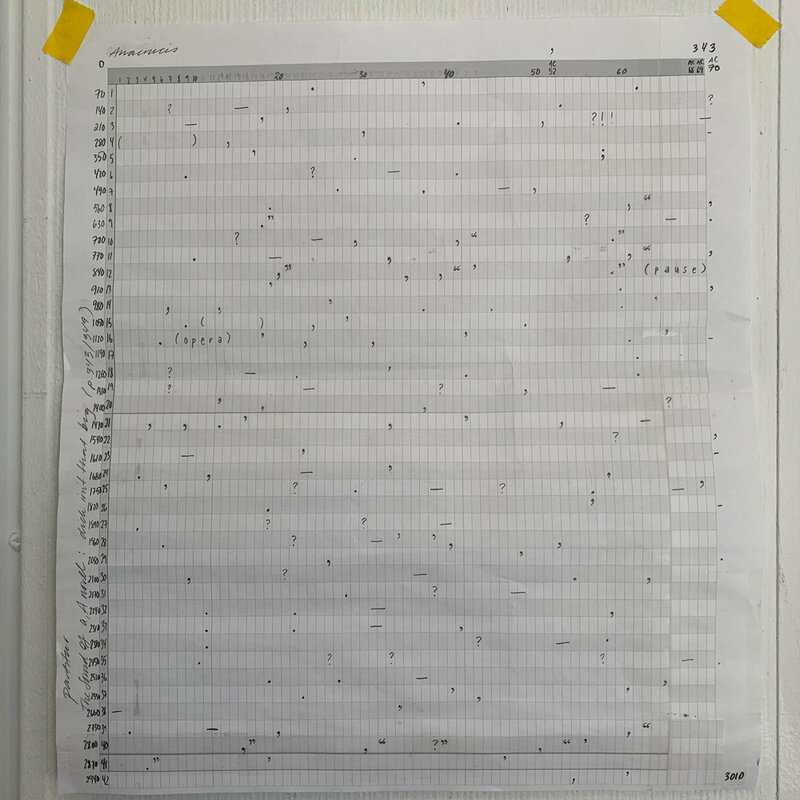 The original score for "p343 for Theodor W. Adorno". Right now, I’m participating with ten scores of summer from the project Black Walnut Grove in the exhibition Radical Landscapes at The Plough Arts Centre in Torrington, UK. 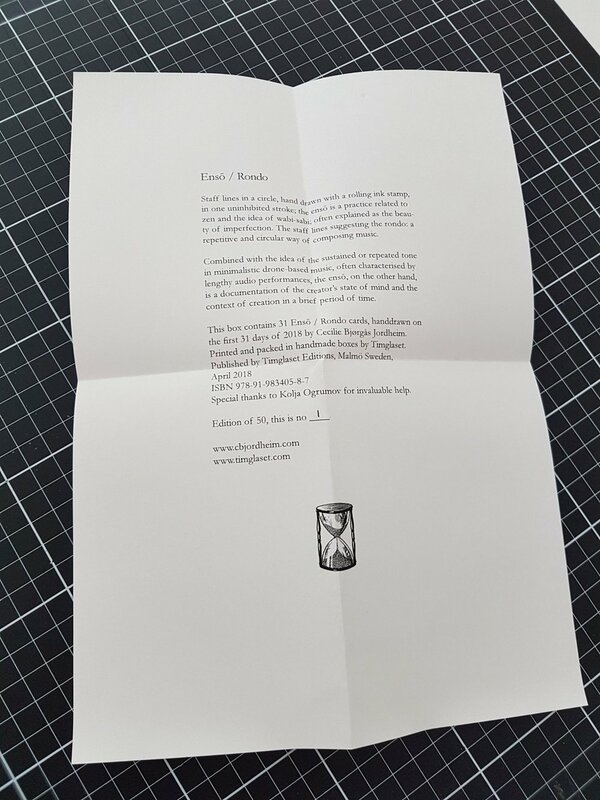 I’ve been invited to publish work in Petra Schulze-Wollgast’s ToCall, a beautiful mimeo printed edition inspired by the last issue of Tlaloc edited by Cavan McCarthy. Tlaloc aimed to be an open forum for modern poetry, and the “main emphasis of Tlaloc was on concrete and visual poetry; contributors included Dom Sylvester Houedard, Ian Hamilton Finlay and Angela Carter, amongst others. The last issue (Tlaloc 22) was published in 1970.” (verdant press, 2019) ToCall is printed in Germany. I am participating in EUROPOE Anthology. Kindly invited by Steven J. Fowler, this is an anthology of contemporary European poetry to be published by Kingston University Press, UK. In August we’ll hopefully have the Geopoetics in Practice in our hands (and on everybody’s lips) fresh from the print, and published by Routledge.